Bitdefender Anti-Ransomware toolkit was just updated and now offers protection against the latest versions of CTB-Locker, Locky and TeslaCrypt. The toolkit, initially created few years ago against CryptoWall and CryptoLocker, should be considered by as many users as possible, since ransomware continues to be a major cyber threat. 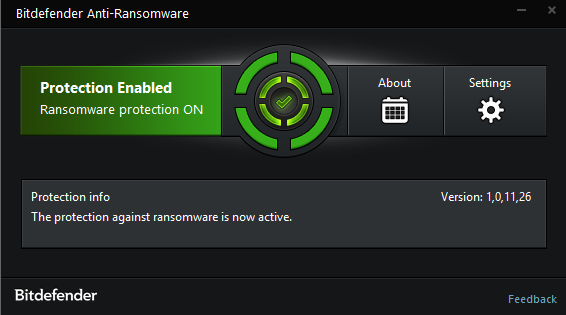 The installation of Bitdefender Anti-Ransomware toolkit version 1.0.11.26 is quite quick. The setup file is small, too – 4.46 MB in size. To minimize it to tray on close button. You can toggle the three options on and off. Needless to say, it is best if you leave the first option ‘on’. Bitdefender Anti-Ransomware prevents your files from being encrypted by the following ransomware families: CTB-Locker, Locky, TeslaCrypt. All three ransomware families have attacked and continue attacking thousands of users on a global level. Unfortunately, a preferred target of ransomware is the healthcare sector, as we continue to see various ransomware pieces released against medical facilities. Even though Locky ransomware is relatively new on the malware scene, it has already been dubbed one of the top ransomware families, along with CryptoWall and TeslaCrypt. In some cases, security engineers are lucky and find encryption flaws in ransomware pieces. However, that’s not the case with CTB-Locker, Locky and TeslaCrypt, as they continue to successfully compromise both home and enterprise users without a hitch. So, install Bitdefender Anti-Ransomware toolkit and ensure your protection against the three vicious ransomware families. BD Total Security 2016’s anti-ransomware protection is quite sophisticated and the functionality of BD Anti-Ransomware should be implemented in it. You can read more about it here: http://www.bitdefender.com/support/how-ransomware-protection-works-in-bitdefender-2016-1549.html. It appears that you don’t need to install the free tool, if you already have BD Total. Hey !, I found this information for you: "Bitdefender Anti-Ransomware Software Review". Here is the website link: https://sensorstechforum.com/bitdefender-anti-ransomware-software-review/. Thank you.